I’ll take my first open water swim of the ‘season’ tomorrow. Lake Awosting should be just about 50 degrees. It will feel stingingly cold for the first few minutes then feel healthfully invigorating. I usually swim for only 10 to 15 minutes in my first dip of the spring, but if custom holds I’ll stretch to 30, then 60 minutes inside of two weeks. Which—other than the last week of March at our Open Water Experience in Kona–will be the longest I’ve swum since January. Since 2007, from November through April, I’ve experienced chronic achiness and fatigue, which is exacerbated by even mild exertion. My doctor diagnosed it as an autoimmune condition. But now I suspect it’s actually a reaction to chlorine. Or at least the ‘chloramine fog’ blanketing the surface of the 50-year old, poorly-ventilated college pool in New Paltz. What do you do when your pool becomes toxic? I’m fortunate to have an Endless Pool, which is well-ventilated and has a sanitation system that needs only a trace of chlorine. I usually swim for just 30 minutes, mostly in a quite gentle current. Not the kind of preparation traditionalists say you need to reach your potential in open water distance races. With my first race, the 2 Bridges 5K in the Hudson River just three weeks away and a planned crossing of Gibraltar Strait in October with three friends, should I feel concern about being under-prepared for long open water swims? Well, I’m not, and I believe I have good reason for my sanguine attitude. Three good reasons in fact. On three occasions, I went into an event or open-water season woefully-undertrained by conventional standards. Once by plan, and twice because of circumstances beyond my control. Each time, I was pleasantly surprised—even stunned–with how well things turned out. In Dec, 2001 I decided to enter the 2002 MIMS, in part to celebrate having reached life’s half-century mark a year earlier. I’d swum only perfunctorily since the previous summer, and one day after I registered the college pool began a 3-week holiday closure. With travel for work in late January, I finally began swimming regularly in early Feb, leaving just four months to prepare for a 28.5-mile swim. While I lacked an aerobic base, I felt confident in my efficiency base and decided to focus on making that even stronger. I wanted to test the proposition that it’s possible to comfortably complete an ultra-marathon swim on non-ultra training volume. For the next 16 weeks I averaged about 16,000 yards per week (a half to a third of what other MIMS’ers were doing), with the exception of swimming a 10,000-yard, 3-hour pool practice in weeks 14 and 15, raising my total for those weeks to a bit over 20,000 yards. I swam those not with the intent of building extra endurance, but to see if I could finish each session feeling more energized than when I started by swimming with consummate ease. Doing so showed me I was on track for a successful marathon. On marathon day, I swam as easily as possible, but intent on making every stroke count. Or, put another way, not wasting a single muscle contraction. Taking a quite leisurely 49 strokes per minute, it was essential I travel a good distance on each. Swimming like a tourist, (and slowed by relatively sluggish currents where my paddler guided my hugging the Manhattan shoreline—the rest of the field was closer to mid-river where the currents are much faster) I reached the Harlem River, about 8 miles into the race, well behind the rest of the field. But over the next 20 miles I passed three other soloists and a relay. Not bad for an ‘undertrained’ swimmer. And despite being badly dehydrated in the final miles, because of inexperience planning my nutrition and hydration regimen, I felt only moderate fatigue upon reaching the finish, which I reached in 8 hrs 53 minutes. After drinking 64 oz of water on the drive home, I felt fully recovered the next day. In October 2004, while doing a bench press set—mindfully, with moderate weight and impeccable form—I ruptured the biceps tendon in my right shoulder. For a swimmer, this is normally a very serious injury requiring 9 months or more to return to full strength. HMO requirements delayed surgery for 5 months, while I did more conservative therapies. It was evident I’d need surgery (I didn’t have a diagnosis yet—an MRI was inconclusive) because, after months of therapy I experienced disabling pain attempting undemanding tasks like pouring tea from a kettle, flipping a wall light switch, donning my seatbelt. However, two months after the injury, and before surgery, I could swim pain free. 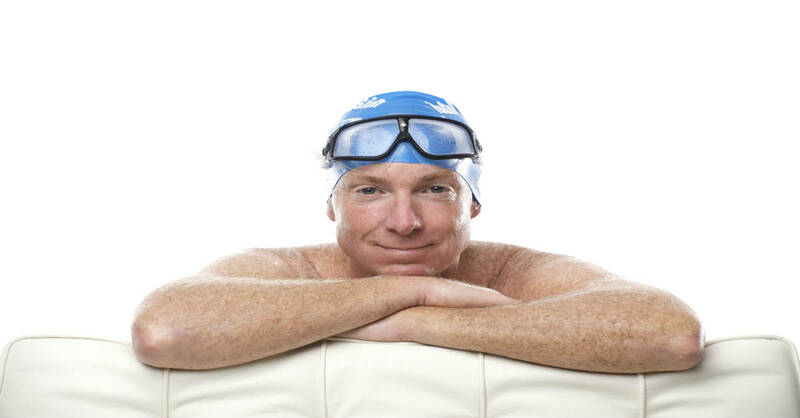 By modifying my stroke to avoid pain—the origin of the Mail Slot focal point—I was able to swim pain free, and even a bit faster than before the injury! I had surgery in Feb 2005, followed by 3 weeks with my right arm in a sling and 3 months under doctor’s orders not to swim any whole stroke. I used the Endless Pool to replicate exercises I was doing in PT and to gently explore range of motion. For that time, ‘swimming’ meant easy reps of the TI SpearSwitch drill, in which I could hone balance, streamlining, and rhythmic rotation without lifting arm from water. To avoid over-eagerness, when I applied water-pressure with my right hand, I visualized the staple holding tendon-to-bone pulling out. Five months to the day after surgery—following just two months of quite moderate whole-stroke training—I swam the Betsy Owens 2-Mile Cable Swim. In 2004, I’d swum a personal best of 49:20. Swimming with modest expectations, I was dumbfounded to see 45:40 displayed on the race clock as I reached the finish line. I led the 50-54 age group for the National Masters title for 3000 meters, being passed in the final 200 meters to finish 2nd, to that date, my highest finish ever in a National championship. What could be the explanation for improving my personal best for two miles by over 3-and-a-half minutes after having my training severely restricted for most of the 10 months preceding the event? Last year at this time, I was looking toward the upcoming open water season with rather modest expectations. Because of a torn meniscus in my right knee at Christmas, then four months hampered by autoimmune symptoms, I was restricted to swimming in the Endless Pool three times a week for 30 minutes (the equivalent of less than 5000 yards per week) at very gentle current speeds and minimal effort levels. As I began my racing season (also at 2 Bridges), I told myself I’d take pleasure in the social aspects of attending the events races, seeing friends and enjoying the experience, not allowing finishes below my usual standard to detract from the pleasure of simply swimming. In that first race , on June 2, I finish in mid-pack but enormously enjoyed being there nonetheless. A week later I began swimming regularly in Lake Minnewaska, and my symptoms also began to abate. I began swimming at steadily brisker tempos, using my Tempo Trainer. During my five months of gentle stroke tuning in the Endless Pool, I’d acquired an unprecedented feeling of silky synchronicity in my strokes. That feeling held as I increased tempo from 1.10 to 1.0 to 0.9 seconds/stroke. Soon I felt as if I was flying effortlessly up and down the 200-yard line at Minnewaska. On July 22, I swam my second race of the season, a mile in the ocean at Coney Island. I maintained that silky feeling throughout, but didn’t expect the finish I had. I won the 60-64 age group by a minute. I also placed in the top 10% of the field overall—something I hadn’t done in at least five years! Over the following three weekends, I swam three more races—another ocean mile, followed by two races of two miles. I won my age group in each by steadily larger margins. And in each I again placed in the top 10 percent in the field—the most exciting, and least expected, level of sustained racing excellence in my 40 years of open water racing! Again, how to explain this in light of entering the season significantly undertrained —by conventional standards—in both volume and intensity for the rigors of open water distance racing? In particular, all three occurrences of hard-to-explain success occurred in my 50s and 60s. When I was much younger (I swam my first open water race at 22) I never raced well unless I’d done long, hard training. The short answer is that—to a far greater extent in open water than in pool races– it’s possible to do quite well with smart, strategic—yet fairly modest–training. This seems counterintuitive—isn’t open water racing reputed to be far more grueling than pool racing. But there are far more opportunities for error in open water—in starting, pacing, navigation, etc. And it’s like that most of the field will make those errors. Minimizing error can compensate for gaps in training. Doing more with less in open water swimming is of great interest to aging swimmers like me. And of even greater interest to triathletes, who have to make time for three sports. In next week’s blog, I’ll share the particular lessons I’ve taken from these experiences and will apply in my training for the upcoming open water season. As I sit in my car wondering why I signed up for the 5 k and 10 k races at the Long Island Marathon not having the opportunity to train as I should have, I read your words of wisdom. As I mentioned when I met you at the Winthrop swim a thin, yours were the last words I read before my prayers the nights before my open water triathlons. So good to read this…at 67 having much the same experience. Even though I have access to a great pool I have no interest in swimming in it. Have used all kinds of tricks to fool myself into using it but alas, I live for the first time in open water…hence hitting the lake tomorrow am at 52 degrees and thrilled with the prospect. I have been DYING to ask someone if taking 6 months off is a stupid thing to do even though my times are exactly the same year to year whether I pool it or not. Guess I have the answer…so thanks! I’ll be thinking about my mail slot and patient arm and enjoying each breath absent the blue line, the chlorine, and the lane traffic. Where is your lake? I’ll be thinking about you as I swim tomorrow. Can’t wait. PS: Since you say you take six months off, that means you swim six months. In that same lake? Lucky you. I can squeeze in six months in a good year. Beginning of May through beginning of Nov. Temp will be about 45 at the end. Which I can tolerate as well as 50 at the start. Are these 5k and 10k races at the LI SWIM Marathon? If so, when and where? An awesome and inspirational read as ever. Thank you for these blogs. Suggestion/request: for the sake of your international readers, could you please perhaps include metric conversions for your distances and other quantities? It slows down my reading considerably if I have to use Google everytime to convert 16,000 yards or 21 miles or 64 oz. Just a suggestion. Please keep up the good work! After a couple of weeks off from a chest infection, I ended up hurting my back on Tuesday (for the first time in nearly a year) so that’s another 4-5 days lost. Never mind, I’m now looking forward to the 10K at Eton Dorney as an experience. To have fun, swim each stroke well, and have a great day’s swimming. Good thing that I subscribed to your newsletter. I’m training for triathlons (have done an ironman, but are now aiming again for the IM 70.3 here in Norway. Sorry to hear about the aches and all. I’ve alays love to swim, since I was five when I learned how to swim. I also enjoy swimming in a pool. I even love the smell of chlorine! I bought a nose clip, maybe that helps. But – and more important – I saw your comments, about water temperature, and now I guess I could start the outdoor swimming season a bit earlier then planned – because the ice on our lake here just melted away, and it’s really cold. But reading about comments on swimming in 45 – 50 F cold water, hmmm that inspired me to do the same. I’d rather get really cold but not allergic when swimming. Also, I’m rarely sick, so I think I’d tolerate the cold temperatures better then the chlorine/chloramine in the pool. Thanks for a great inspiring website! I encourage you to get a CL Free system for your endless pool. I too should not be in chlorine, even the level of .5 is too much for me. Works great in our pool, But occasionally I do add about a half cup of clorox – about once a month – to play it safe for the water. But that hardly is necessary. Our system uses copper and titanium to sanitize the water. Terry, I am in Maine and between the lake and ocean I usually get close to 6 months. I lasted for 30 minutes today and will spend the rest of the weekend smiling. This is the first year I have eschewed the pool entirely and I feel great in the water. My goal is just to keep my tri swim times the same from year to year. In my age group I consider that getting faster ( twisted logic but if one can age adjust runs, so it should be in swimming). I also keep adding to the length of time I can swim and sometimes, when the water is warm, I think I can swim forever…but then I get hungry. Terry, I messed up my shoulder a couple years ago. Bicep tendonitis and impingment. I went through PT, which helped, but I still cant swim much without pain coming back, even if I go easy. I tried several modifications to my stroke, and he usual rest, ice, etc. I was just getting ready to start competing in masters meets when I injured it. I even started a masters team, with my kids as members along with me. The hope was that they would carry the old guy in the mixed relays. So it is kind of depressing to not be able to do that. The doctor said I might need surgery to make more space in the shoulder, but I’m a little scared about it. How did your recovery go? Be careful of weight training. I was doing light dead lifts and I pulled a tendon in my left shoulder. I am 76 yo so tendons are getting weak. One has to be careful. I will stick to easy open water swimming. Hope this encourages you. Your dvd’s and teachers – I see Gail in Edmonton – have been such a huge source of support for me! Thank you… and I loved this post today. Please keep on writing! Dear Terry, Your ideas make sense in the ears of this 82 yr old. A few years ago A surgeon was to operate on my right shoulder to deal with a very painful bone spur which prevented me giving my all in the breaststroke.. As luck would have it I had to have lower back surgery including fusion of two vertebrae. That was in May. beloved breaststroke and concentrated on easy freestyle for three months. I did break up the distances by gentle interval swimming, 100s and 200s in fartlek style with very small increases in times in successive workout while trying to maintain the easy gliding acion throughout. It worked! I had a go at the Lake Placid 2-mile cable swim in August. Because I was not concerned about anything other than swimming within myself and avoiding potential collisions, I found myself passing people in the last half mile. I was not increasing speed. They were coming back to me. It felt good just to cruise along and concentrate on the maximum result from the minimum effort. I finished in what, for a 78 yr old was a respectable 1:27 and change and was relaxed enough to enjoy the picnic and a couple of nice dark local beers. Last year I felt back in shape and won three Irish Masters Open titles in the 80 plus bracket. Lo and behold, my bone spur seems to have retreated and no longer causes shoulder pain. I attribute that to listening seriously to your advice during the rehab period. Four years after that surgery I am faced with another challenging problem. I wrenched an ankle so badly that I may have to have surgery. This came a few months after a very serious attack of asthma, a recently acquired condition. So here we go again! I know that I will take longer to heal but somehow that easy swimming ( when I do get back to it) will speed the process. So I am taking every word you write into my aging cranium and storing it for reference. I know that I will be slower, but hey, I had great fun and satisfaction in some rewarding swims over the years. I am just happy to know that there is a way back to good health and the real joy of swimming no matter how long it takes. So thanks for all your encouraging words Terry. I hope that my experience will encourage some other old codgers to forget how fast they used to be and concentrate of the sheer delight of easy swimming…. At least it makes me smile when I remind myself that YES, I’ll be back….soon! Thank you for the encouraging article. Your have given me hope for a rather busy OWS season. FYI One of my lane-mates down here at Pace did the “Straiaghts” swim half a dozen years ago. Im sure he would be hapy to share his experience, especialy regarding the guides. I had planned to start the seson with the Two Bridge swim but decided for warmer warters down in Charleston SC (2.4 mi harbor). Hope to see you again at the Greenwich Island Swim. Do less, gain more – very good words for us aging swimmers. I too have had bad reactions to chlorine. I started using a nose clip years ago and it has helped, but I still suspect the chemicals are cause for fatigue and brain fog. How do you know your pool has become toxic? I’ve been swimming at an indoor Y pool for almost 30 years. Usually 3 x per week for 45 minutes each session. As I swim in my Endless Pool, I often wonder what TL is doing today! Thank you for the full update. I am motivated to give my best, knowing you will be reading the blog. I still recall our first meeting in 1989 at the Coral Springs Nationals when you were, what 56, and I 38. Lots of water over the dam, or around our streamlined bodies, since. I look forward to seeing you at the ‘Betsy’ if not sooner. It’s been too long since we corresponded. Your kids were swimming HS then. They must be late 20s now? My recovery has gone beautifully. My right shoulder is as good as new. My left is less stable, a result of a torn cuff 15 years ago. They cleaned it up, but didn’t repair the tear. But good technique keeps it functioning fairly well. If it were a private pool, I’d definitely do what you’ve done. But we teach public lessons in it so have to satisfy Board of Health requirements. Maybe one day they’ll move into the 21s Century. I’m delighted to hear you’re following me. I appreciate that suggestion to make metric conversions–at least for distances–and will remind myself to do so. It’s fairly easy to figure. I’m fortunate to have quite a large international following and few outside the US use the English standards of measure. It has been a long time. Our two older girls have flown from the nest. The oldest finished her nursing degree and now has a toddler of her own. Our second is doing rotations in the ER on her way to being a PA. She calls me regularly to tell me she stitched up some guy or did CPR on a 70 year old (who unfortunately was too late getting to the hospital to revive). Our two youngest are swimming in college on scholarships, and I only get to coach them in the summer. But my wife and I have more kids to coach than ever. Our new club team has about 70 registered members. Lots of little people for her to work with, and most of the high school swimmers in the area are in my group. It’s both rewarding and frustrating. Some kids think our workouts are “too easy”, but they are the ones who are most resistant to changing heir technique. Strangely enough the ones who manage to finish everything on the menu with the quality I want are the most successful. Intolerance of pool chemicals is known to get worse with older swimmers. Symptoms are often similar to a bad attack of hay-fever. This is discouraging to the people who would get the greatest benefit from regular swimming. Ozone or UV treatment results in a much better swimming environment, but I guess that the people who make the decision to go for the cheapest option aren’t swimmers. Let them know about it. Tell them you don’t like swimming in their toxic soup!